Human and mouse ATMs express NPFFR2, which increases after IL-4 exposure. (A) Diagram of human cell types of the omental fat depot analyzed in this study. ATMs, CD68+CD14+ ATMs; SCs, CD68–CD14– stromal cells. (B) NPFFR2 transcription in SVF and adipocytes of human omental fat (n = 4). (C) FACS analysis of NPFFR2 expression in human ATMs and SCs. (D) NPFFR2 immunostaining in human omental fat. Scale bar: 25 μm. (E) TEM image of an NPFFR2+ human ATM. Scale bar: 0.5 μm. (F) Diagram of the analyzed mouse fat depots. (G) Relative transcription of Npffr2 in SVF of lean mice; each data point shows pools of cells from 3 mice. (H) FACS analysis of NPFFR2 expression in mouse ATMs and iMCs. (I) Immunostaining of NPFFR2 in mouse eWAT. Arrowheads indicate the cell border. Scale bars for both images: 25 μm. (J) TEM image of an NPFFR2+ mouse ATM. Scale bar: 0.5 μm. (K) Western blot of NPFFR2 in mouse ATMs. Lanes 1–3: ATMs from eWAT; lanes 4–6: ATMs from iWAT. (L) FACS analysis of NPFFR2 expression in mouse macrophages. PMFs, peritoneal macrophages; KCs, Kupffer cells; BMDMs, nonstimulated bone marrow–derived macrophages (n = 3). (M) Npffr2 transcription in mouse ATMs after 100 ng/ml LPS or 2.5 ng/ml IFN-γ treatment for 4 hours in vitro or after 3 months on a NCD or HFD (n = 3 and 5, respectively). 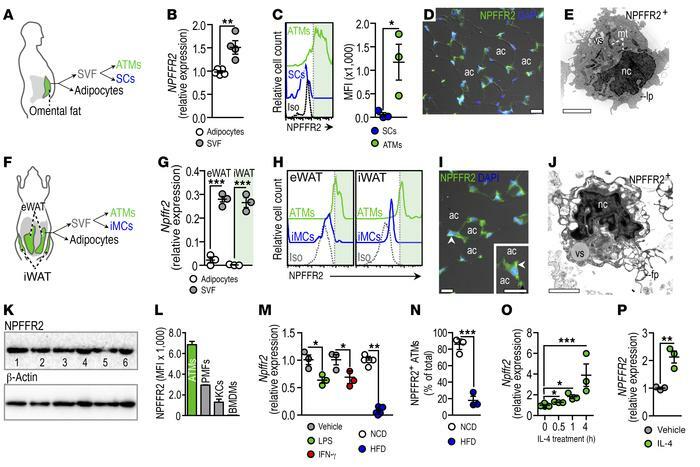 (N) NPFFR2+ ATMs in NCD- or HFD-fed mice. Each data points represent pooled ATMs from 2 mice. The experiment was conducted 2 times. (O and P) Npffr2 and NPFFR2 transcription after 10 ng/ml IL-4 treatment of mouse (O) and human (P) ATMs (n = 3). Human ATMs were treated for 4 hours. *P < 0.05, **P < 0.01, and ***P < 0.001, by unpaired, 2-tailed Student’s t test (B, C, G, M, N, and P) and 1-way ANOVA with Dunnett’s post-hoc test (O). ac, adipocyte; fp, filopodia; iMCs, immature myeloid cells; iso, isotype; lp, lamellipodia; MFI, mean fluorescence intensity; mt, mitochondria; nc, nucleus; vs, vesicle.